DANL. M'INTYRE, Law-Clerk, Dundee, Witness. ROBERT URQUHART, Law-Clerk, Dundee, Witness. EDMUND REID, Confectioner, Edinburgh, Witness. JAS. 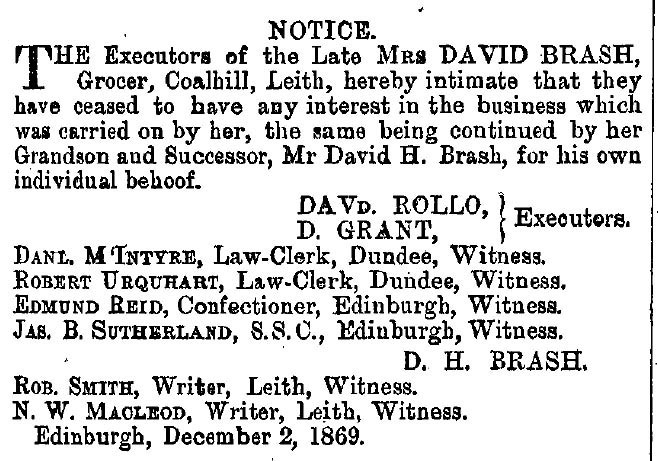 B. SUTHBRLAND, S.S.C., Edinburgh, Witness. ROB. SMITH, Writer, Leith, Witness. N. W. MACLEOD, Writer, Leith, Witness. 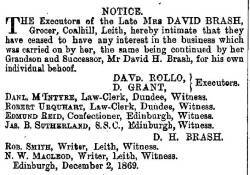 The cited information was sourced from Electronic Document (email, file) published by The Edinburgh Gazette on December 3rd, 1869 <https://www.thegazette.co.uk/Edinburgh/issue/8012/page/1561> (Ref: The Edinburgh Gazette 3 December 1869 Issue: 8012 Page: 1561) This citation is considered to be direct and primary evidence used, or by dominance of the evidence.